World Asthma Day (WAD) is an annual event organized by the Global Initiative for Asthma (GINA) to improve asthma awareness and care around the world. The theme of World Asthma Day 2010, Tuesday, May 4, 2010 will be “You Can Control Your Asthma.” On WAD, GINA also plans to launch a campaign to reduce asthma hospitalizations by 50% in 5 years. Patient education plays the pivotal role in control of asthma. Nature of the disease and causes of inflammation and asthma triggers. Asthma is a persistent illness categorized by recurring attacks of breathlessness and wheezing may include coughing and chest tightness, which differ in severity and frequency. Asthma cannot be cured, but it can be controlled with proper management of environment and medication. 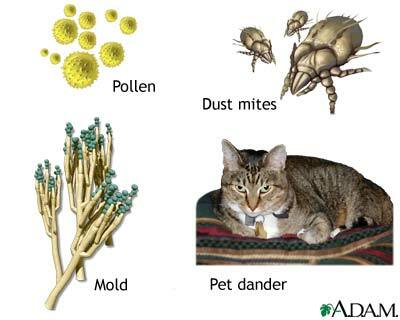 Most common cause is inhalation of allergens and bronchial hyper responsiveness to otherwise trivial stimuli. When triggered by stimulus narrowing of airway can occur because of smooth muscle contraction, edema of the wall and increased mucus secretion. The two main factors that contribute to asthma are inflammation of the airway passages and hyper reactive bronchi**. An asthma attack can occur when you are exposed to things in the environment, these are called asthma triggers. Asthma triggers can be very different for different person with asthma. It is important to understand what triggers your symptoms and what makes them go away. You and your health care provider can work together to assure that you avoid exposure to the substance that triggers your asthma symptoms. Smoker’s are at a greater risk for developing asthma. Some medicines Some medications aspirin or other non-steroidal anti-inflammatory drugs (NSAID) such as ibuprofen; and beta-blockers. Asthma cannot be cured, but it can be controlled with proper management of environment and medication. Most important is to avoid environmental trigger factors. Try to find out your triggers and avoid them. Vacuum Clean (with HEPA High Efficiency particulate) the house thoroughly at least once a week. If you cannot avoid exposure, try to minimize contact. Block crevices, wall cracks and windows. Vacuum and sweep the floor after meals, and take out garbage and recyclable. Use lidded garbage containers in the kitchen. Wash dishes immediately after use and clean kitchen surface, under stoves, refrigerators or toasters where crumbs can accumulate. Clean up mold growth with water, detergent (and 5% bleach) and dry the area. Wash clothing with soap and water and dry. Seal leaking roofs or pipes. Use dehumidifier in damp areas. Periodic assessments and ongoing monitoring of asthma are essential to determine if therapy is adequate. 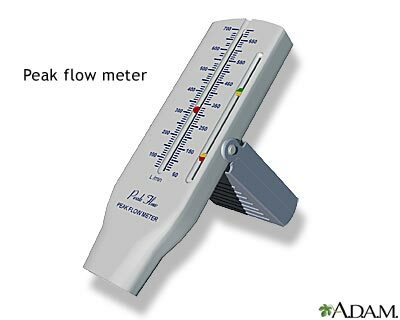 Patient should be educated regarding use of peak flow meter and symptoms and signs of an asthma exacerbation. Regular follow-up visits are important. Lung function decreases 3-4 day prior to an asthma attack thus it can help warn of impending exacerbation. Since asthma is a chronic disease, it requires ongoing management. This includes using proper medications to prevent and control asthma symptoms. There are two general classes of asthma medications, quick-relief and long-term controller medications. Quick-relief medications are used to relieve symptoms during acute asthma attack. It includes Bronchodilators and oral corticosteroids. Bronchodilator increases the diameter of the air passages thus easing the flow of air to and from the lungs. The short-acting bronchodilators used to relieve symptoms during acute asthma attack. Eg Metaproterenol , ephedrine, terbutaline and albuterol . Long-term controller medications are taken on a regular basis to control airway inflammation and treat symptoms in people who have frequent asthma symptoms. Inhaled corticosteroids, cromolyn (need to be taken four times per day) and leukotriene modifiers can help control the inflammation that occurs in the airways of most people who have asthma. Inhaled long-acting beta agonist are symptom-controllers t hat open your airways and may have other beneficial effects used only along with inhaled corticosteroids. Theophylline is the most frequently used. Immunotherapy (allergy shots) may help if avoidance of irritant and medications fail to control asthma. The treatment begins with injections of a solution of allergen given one to five times a week, with the strength gradually increasing. Patients with persistent asthma should be given an annual influenza vaccine. You can read my older posts about Occupational asthma risk and protective measures to avoid workplace allergens . We all know how important air quality is, if you have ever spent a few hours on a plane you probably know that poor air quality has very negative effects, and that in some cases air quality has a very significant effect on general health.